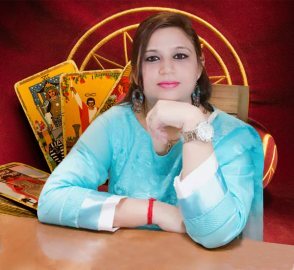 MEENAKKSHI KAIN is a leading tarot reader. She is also an ace life coach and numerologist. If you have a problem in your personal or professional life and want to seek help, then head straight to Meenakkshi Kain. With an experience of many years, Meenakkshi has become the youngest tarot reader on the block. Her vivid and simple approach towards life helps her give realistic solutions. You can also get in touch with her for numerology, life coaching, and crystal ball gazing services. Her immense knowledge and accurate predictions have helped numerous people overcome their inhibitions and succeed in life. A lot of people think that astrology is just about horoscopes. But this isn’t true. There are so many branches of astrology like numerology, tarot reading, crystal ball gazing and a lot more. Meenakkshi believes in simple and doable solutions. She understands the anxiety and curiosity that people have, thus, ensures that you get all the answers. Whether it is tarot reading or healing, you can rely on all our superlative services. Keeping in mind the varying needs of clients, the services are customized as per their requirements. Meenakksi is known for her accurate and precise predictions. She closely analyses the pattern and relationship of your planets and birth chart to give you correct guidance. It wont be wrong to say that she has dedicated her life to tarot reading. If you wish to avail astrology services or want to get trained under her guidance, then get in touch with us. The increasing number of happy and satisfied customers is indeed a proof of the committed and dedicated services. In tough times when everything seems bleak and dark, you need a guiding light that can give you hope. Meenakkshio helps you find that hope through her efficient predictions about future.